One of the oldest countries in the world, Ethiopia was the only African nation not to fall under colonial control. The continued independence left the country with a wealth of undisturbed historical sites and cultural practices--reasons enough to plan a vacation in Ethiopia. 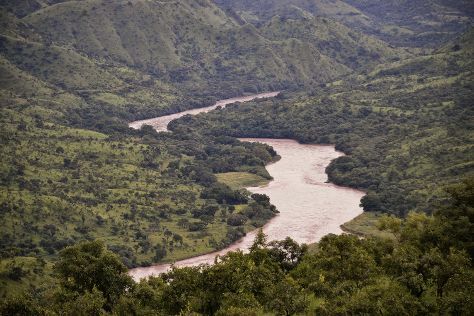 Ancient ruins, hill tribes, wild forest areas, gushing rivers, and depressions filled with active volcanoes represent just some of the many Ethiopia attractions worthy of your attention. Amhara Region: This area possesses many natural wonders, rich history, and amazing cultural heritage evident in its 17th-century Moorish-style palaces and lakeshore Orthodox monasteries. Southern Nations, Nationalities, and People's Region: With this region on your Ethiopia itinerary, you will have a chance to meet some of the 45 indigenous ethnic groups living in this part of the country--you'll also be able to combine cultural sightseeing with a spectacular safari experience. Tigray Region: In this area, you'll not only discover many pre-Christian monuments, but also scenic mountain chains, rock-cut churches, and historic mosques. Harari Region: Explore a maze of alleyways in a World Heritage-listed Islamic fort of Harari Region to see over 100 mosques surrounded by majestic walls, and visit a smuggler's market or a memorial center dedicated to French poet Arthur Rimbaud. Addis Ababa: Nestled at the foot of Mount Entoto, the bustling capital of Ethiopia ensures a chance to visit chaotic local markets, discover both churches and mosques, explore charming coffeehouses, and hike in the surrounding hills. Lalibela: A group of World Heritage-listed churches make Lalibela an attractive destination for millions of visitors who wish to take part in ancient religious ceremonies and enjoy scenic surrounding mountains. Gonder: Explore fortified castles and palaces of Gonder, a former capital of the Ethiopian Empire that's an ideal base for taking trips to nearby mountain and lakeside monasteries. Bahar Dar: Add this town to your Ethiopia trip and enjoy lakeside gardens thriving in a pleasant climate that makes this area popular with foreign tourists. Axum: One of the oldest settlements in Africa, World Heritage-listed Axum draws visitors with its churches and many museums that testify to the historic significance of the area. Rock-Hewn Churches of Lalibela: This World Heritage Site was probably built between the 12th and 14th centuries--the site's layout resembles Jerusalem and features many ceremonial passages. National Museum: Deepen your understanding of ancient world history and Ethiopia's heritage by visiting National Museum, a three-floor galore of artifacts, including the world famous "Lucy." Simien Mountains National Park: Follow the ridges of a World Heritage-listed national park to spot rare wildlife, including walia ibex perched on terrifyingly steep slopes. Red Terror Martyrs Memorial Museum: At this Ethiopia tourist attraction, you can see torture instruments, coffins, blood-stained clothes, and even mortal remains of those who fell victim to a violent 1970s regime. Entoto Hill: Explore a former royal summer palace and enjoy sweeping views of Addis Ababa from a hilly area forested by eucalyptus trees--the hill also includes a government-run space observatory. Lake Tana: When you add the largest lake in the country to your Ethiopia itinerary, you will have a chance to see the source of the Blue Nile and a major Christian site with several churches, boasting impressive murals. Holy Trinity Cathedral: A number of national figures were buried at this cathedral, built to commemorate Ethiopia's liberation from Italian colonizers. Ethnological Museum: Home to one of the best museum collections in Africa, this building used to be Haile Selassie's imperial palace. Blue Nile Falls: A massive fall amidst lush vegetation, this force of nature remains one of the most popular tourist attractions in Ethiopia. Fasiladas Bath Timket: A large rectangular pool used for Orthodox baptisms, this notable site serves as a major place of pilgrimage, providing the setting for the country's most important religious festival. Your trip to Ethiopia will not be complete unless you try a range of spicy "wats" (meat stews or curries) and vegetables placed over a thin pancake called "injera," a type of flatbread. Communal eating is very popular in Ethiopia, so you'll have plenty of chances to practice detaching a bit of gluten-free injera and scooping up a tasty mouthful of wat and vegetables. Wats can be made with chicken, beef, or lamb, but it's the blend of spices called "berbere" that makes their unique taste. Although wat is often a meaty dish, vegetarians will have no problem finding a meat-free alternative. Although Ethiopia is far from a shopper's paradise by Western standards, the country offers a range of shopping experiences in big-city malls and traditional markets evenly spread across the country. The best buys for authentic souvenirs include handicrafts, such as colorful handmade cotton fabrics and scarves called "gabbi" and "shamma," images of Orthodox saints handpainted on woodblocks, and a variety of handheld crosses. Locally grown coffee, whether ground or in whole beans, can also make a good souvenir. To accompany coffee, there is a variety of easily transportable coffee pots available for tourists. Those who enjoy communal eating may want to buy goatskin injera holders or tin plates. Visiting the bustling Merkato, Africa's largest outdoor market, will give you an insight into how residents of Addis Ababa shop for essentials. While there, browse the packed stands for handmade soaps, spices, harvested foods, electronic goods, and antiques. If your find yourself at any one of the country's markets, use your bargaining skills--haggling for a good price will add a bit of local flavor to your Ethiopia holiday, and ensure you walk away with a good deal on a range of nifty souvenir items. Compared to many other parts of Africa, Ethiopia is safe, with few seriously violent crimes committed on a yearly basis. That said, petty crime exists and can affect you, especially in the capital. To avoid it, always look like you know where you're going and what you're doing--basic awareness of your surroundings should keep con artists and pickpockets at bay. Many Ethiopians are deeply religious--to make your Ethiopia holiday a more pleasant experience, dress and behave modestly. The rule of thumb here, as in almost everywhere else in the world, is this--ask a local friend or acquaintance for a few tips about social etiquette to prevent any embarrassing situations. Show proper respect to every new person you meet, and greet people politely and pleasantly before launching into a complex conversation. When eating, follow the lead of the locals. The rules may not be the same as in your home country, so you'll enjoy the food and the company more if you behave as the natives do. Ethiopia observes many religious festivals, both Christian and Islamic. Known as "Gemma," Orthodox Christmas is celebrated on January 7 with prayer services and various contests, such as racing and folk dancing. "Timkat," which marks Epiphany in January, is celebrated over three days. Those visiting Gondar and Fasiladas Bath Timket at this time can attend a special ritual at one of the country's top tourist attractions that's also a major place of pilgrimage. If you like sports, you may wish to add All Ethiopian Games to your Ethiopia itinerary in March. This week-long sporting event is enhanced by various cultural performances across the country. Addis Ababa hosts Ethiopian Film and Music Festival in May, with many outdoor film screenings and a series of concerts attracting big crowds. In Southern Nations, Nationalities, and People's Region, Arba Minch Festival of Music and Dance is held in December, showcasing distinct and diverse local traditions and cultures. Ethiopians are very polite and proper greetings are important to them--make sure you introduce yourself properly and begin with a polite greeting before asking questions or attempting to start a serious conversation. Handshakes are common among men--remember, this is a conservative country by Western standards, so behave accordingly. Foreign men should avoid direct eye contact and maintain a formal distance from local women as a sign of good manners. If you're not sure how to behave on your Ethiopia holiday, ask a local friend or your tour guide for some advice. Minding the local customs and ensuring you don't offend the people you meet with careless behavior will make your experience more pleasant and increase your chances of making a few new friends. High season (January to March) brings sunny skies and warm temps--consider this the best time for your vacation in Ethiopia. This is also the prime time for wildlife spotting and attending a few festivals, including the popular and culturally significant Timkat. Shoulder season (October to December) means fewer visitors--yet the skies will be equally sunny and the outdoor opportunities equally plentiful as during the high season. This time of year is ideal for visiting Danakil Depression, home to some of the weirdest landscapes on the planet. Low season (April to September) brings rains, and hot temps to the lowlands. You'll have a hard time spotting wildlife if you take a trip to Ethiopia at this time--overcast skies may also color your entire vacation in dark shades, and make for some really dull photos. Ethiopia is a big country with rugged terrain and some challenging roads--don't expect to get anywhere fast during your vacation. Domestic flights will save you lots of time during your Ethiopia holiday. It's often less expensive to book domestic flights once in the country--the national carrier is your best bet, with a good safety record and an extensive network. Buses are good for covering shorter distances. Go for the private operators, which use newer buses with good features (reclining seats, A/C, onboard restrooms). With private buses, you can buy tickets on the spot--unlike government-run operators, private carriers don't require prior reservations, which gives you lots of flexibility. Having a private car is probably the best option--especially if you also hire a professional driver/guide/interpreter. You'll find enough reputable rental agencies catering to tourists--remember, some national parks only allow entry by 4WD vehicle, so keep that in mind as you finalize your plans. Tipping guides and restaurant service staff is not mandatory--leaving something behind will, however, be both fair and generous, ensuring even better service next time. Tip a taxi driver if you are hiring the vehicle for a day or longer. Always agree on a price before entering the car.